Back in September, I set out to create a beef stew recipe that used sweet potatoes ("jewel yams") instead of white potatoes. The color of the sweet potatoes was also supposed to act as a substitute for the carrots since I'm not the biggest fan of carrots in stew. Let's face it, most of us eat beef stew for two reasons: the beef and the potatoes! Anyway, an unfortunate mix-up with my grocery order resulted in something I wasn't really expecting. While the stew tasted delicious, I vowed to be more mindful when ordering the ingredients from Fresh Direct and to try the stew recipe again. Voila! Here it is, folks! Take Two! Place stew beef in a large plastic bag with the flour, salt, and pepper. Seal the bag and toss until the beef is evenly coated. Heat the olive oil in a large skillet. Brown beef on all sides, working in batches if necessary. Remove beef from skillet and place in a bowl. Pour beef broth into skillet and simmer, scraping the brown bits off the bottom of the skillet. Place potatoes in the base of a preheated 4-5-quart slow cooker. Layer on the browned beef, onions, and garlic. Pour in beef broth, water, and Worcestershire sauce. Cover and cook on low for 7 hours. Add frozen green beans and cook the stew for an additional 15-20 minutes. Season with salt and pepper, to taste, before serving. If you liked this post, consider subscribing to Taste As You Go’s RSS feed or signing up for email updates so you don’t miss a thing! So was 'take 2' what you hoped? The ingredient list looks like it should have been a success. Joan - Take Two was great! I found that the sweet potatoes softened much more than the russet potatoes after slowly cooking for nearly 8 hours. The contrast between the texture of the two potatoes was very nice! this looks delicious! I can't wait to try it out! Meg - It was! Let me know how you like it when you make it! Hi. 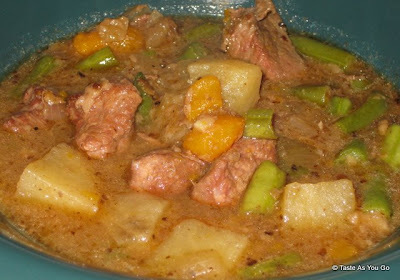 This is awesome Beef Stew with Sweet Potatoes recipe. I love it. If you wont mind I'd love to guide Foodista readers to your post. Just add the foodista widget to the end of this post so it will appear in the Foodista pages and it's all set, Thanks! I almost forgot, you can also place a foodista widget on your past blog so others can view it. Thanks again! Christine - Thank you for your comment! I posted a Foodista widget on the recipe prior to your comment, so everything should be all set. For posts moving forward, I use my discretion when placing widgets on my blog. Solicitations on behalf of Foodista are not necessary.